When brilliant design transforms the way children think about the playground, the entire world takes note. Perhaps this is what Vo Trong Nghia Architects had in mind when they designed The Farming Kindergarten — which is a prototype for sustainable school design where children of factory workers in Vietnam can learn how to grow their own food. Set to be complete later this year, the school building will house 500 children and feature a knot-shaped rooftop, which will be used as a vegetable garden. The roof’s surface pours into a continuous loop around three courtyard playgrounds and slopes from the ground to the peak of two stories, making an easy climb to the vegetable garden a fun adventure for teachers and their pupils. Click through our gallery to see more of this schoolhouse magnificence. “While these internal courtyards provide safety and comfortable playgrounds for children, the roof makes a landing to the courtyards at both sides, allowing children to enter a very special eco-friendly experience when they walk up and go through it,” the architects told Dezeen. The Vo Trong Nghia team is no stranger to receiving accolades for their innovative, and earth-friendly designs. Nghia was awarded last year at the World Architecture Festival for his naturally ventilated Binh Dunong School that made use of vertical louvers and perforated screens instead of expensive and energy zapping air conditioning to keep buildings cool in the tropical weather. 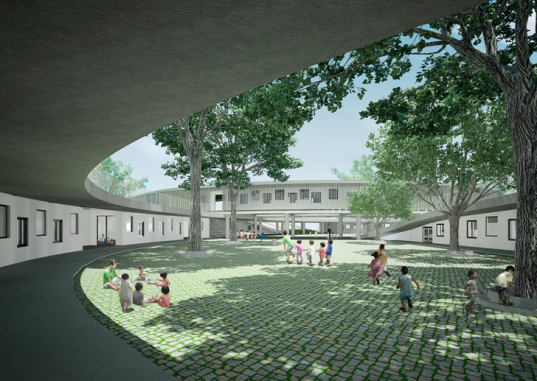 The design of the new Farming Kindergarten also presents an exploration in education. Visible energy-saving architectural elements of the building design include: water recycling, solar water heating, pc-concrete louver for shading and more, to help children see their role in sustainable and responsible living. When brilliant design transforms the way children think about the playground, the entire world takes note. 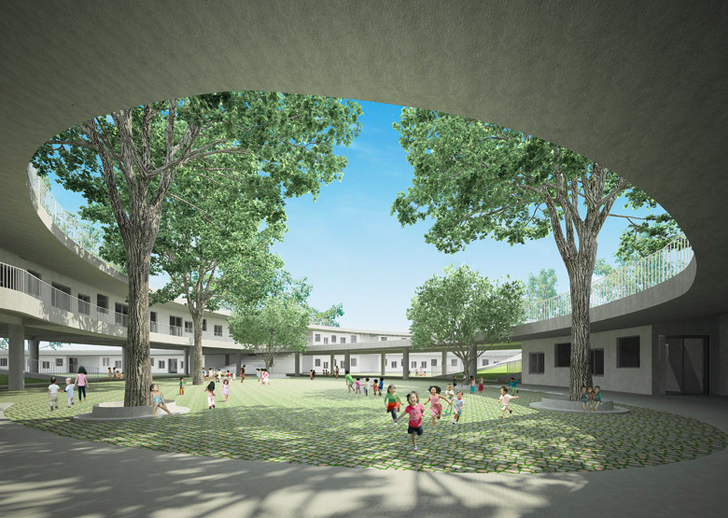 Perhaps this is what Vo Trong Nghia Architects had in mind when they designed The Farming Kindergarten -- which is a prototype for sustainable school design where children of factory workers in Vietnam can learn how to grow their own food. Set to be complete later this year, the school building will house 500 children and feature a knot-shaped rooftop, which will be used as a vegetable garden. The roof�s surface pours into a continuous loop around three courtyard playgrounds and slopes from the ground to the peak of two stories, making an easy climb to the vegetable garden a fun adventure for teachers and their pupils. Click through our gallery to see more of this schoolhouse magnificence.